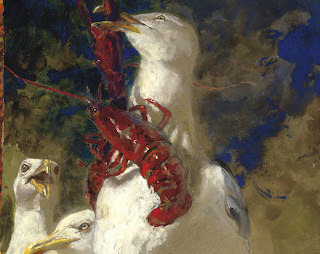 Jamie Wyeth's exhibit, Seven Deadly Sins, opens May 16th at the Farnworth Art Museum and Wyeth center in Rockland. From the Farnsworth website, "The exhibition of Jamie Wyeth’s 2007 series of paintings, The Seven Deadly Sins, is a rare example of a contemporary artist taking on a subject long associated with the history of Christian art. The subject’s focus is human frailty, specifically the sins of pride, envy, anger, greed, sloth, gluttony, and lust, codified as the seven deadly sins in the writings of the late thirteenth-century Dominican, Saint Thomas Aquinas." The exhibit runs through august 30th. Learn more here.